So I'm getting a new computer. That's not something I often do. After all, I'm still running Windows XP over here. Really. I've been backing up files in preparation for the move to a new machine, and in doing so I have uncovered some interesting things from other times when I backed up my computer. I have had a website for... well, we'll just say many years. I had one back in high school that was basically just a host for Doom levels I made. Real quick, speaking of that, I promise I'll get the DOOMsday packs up and running again at some point. They'll be back. Anyway, I have access to a few different versions of my website throughout the years. I thought maybe I would show you a screenshot of what the ones I have access to looked like. 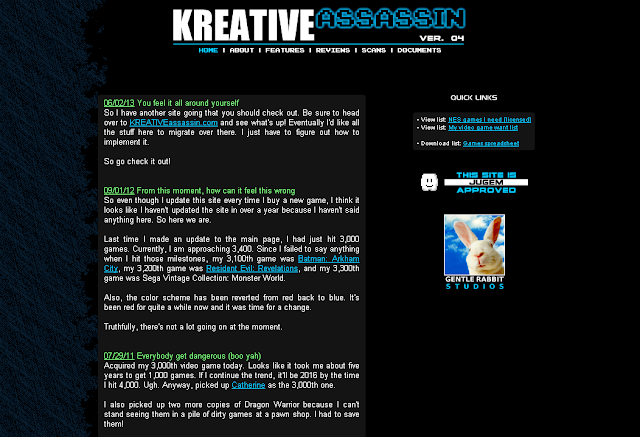 This was my earliest attempt at making a site that wasn't just Doom levels. It was intended to be a showcase of games I owned, and that was a theme among my sites up to and including this one. I was obsessed with a GameCube game called P.N. 03 at the time, so the site was modeled after that game. The hexagon gradient background was actually from the official P.N. 03 website. It totally ripped it off. You can see the site uses frames, which is a sign of the times. The overall feel of the page was just too busy. Even the logo with all those NES characters is extremely busy. The German under the logo is a Google translate (or maybe Babel Fish) of a lyric from a KMFDM song. It's supposed to say, "There is nothing to gain from the absolute truth," and whether or not it does will remain a mystery unless you speak German. The image to the right is also from a KMFDM music video from their song Megalomaniac. That's actually where my online handle comes from, too. 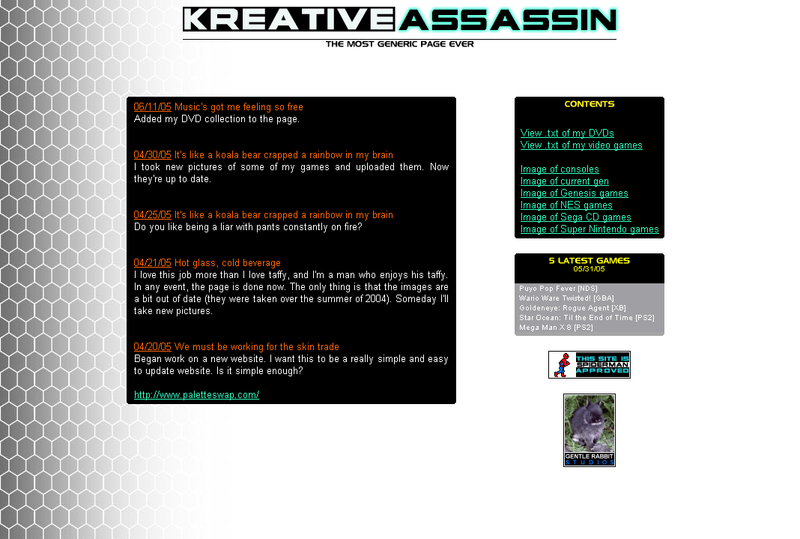 In the video they spell it KREATIVITE 'assassin,' and for whatever reason I changed it to KREATIVEassassin and went with it for... oh god... 20 years. Ultimately, the page became too unwieldy, and I chopped a lot of it out and made "the most generic page ever." It is pretty generic. It's a lot cleaner and less cluttered than the other version, though. But it's very bland and not something that's going to keep your attention for very long. It uses the same colors, same background, same logo (minus the game characters), and ditches the frames. I ran with this one for about a year before changing the overall design. Now this is starting to look familiar. This is the design I kept up until the moment I made this site you're looking at now. This is my favorite version of this design. It's extremely well organized and looks pretty good. I especially like the colors. I mean, clearly I do. I used them again on this site. Note the "Ver. 04" under the logo. Counting my Doom site, this was my fourth website. This is not the original version of this format, though. Apparently, and I had forgotten about this, there was another version that preceded it where it looked the same, but the green text was lilac. Kind of a strange design choice going with the electric blue and lilac, but it is what it is. 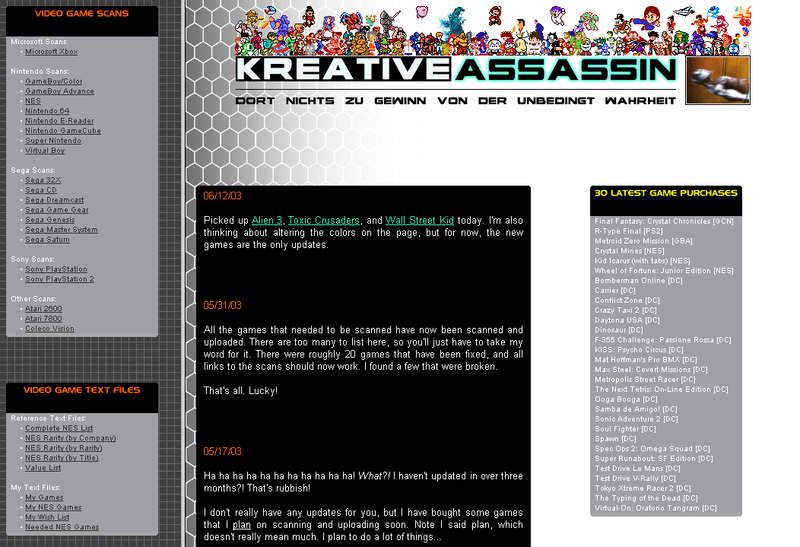 I completely forgot about it until I found a snapshot of the site on an online archive. I'm not going to take a picture of it because it's literally the same except that one color. 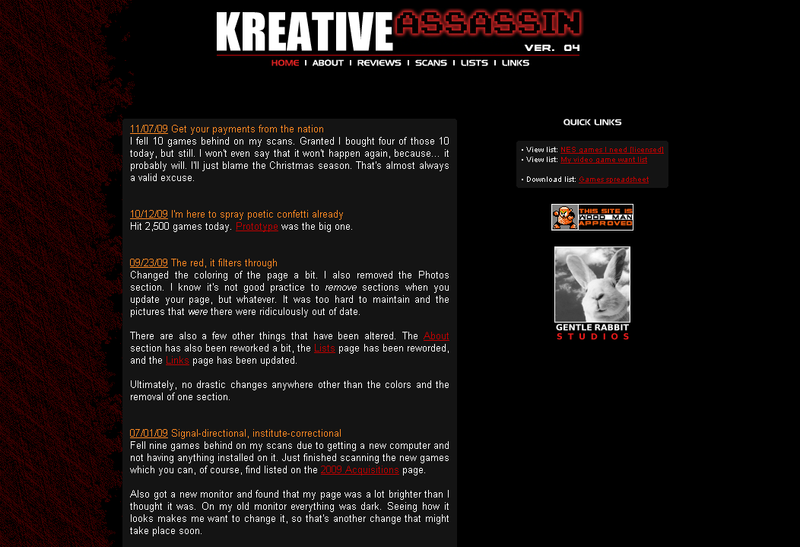 I used to name the color schemes for my site. The purple and blue version was called Ebon Ink. This one was called Irradiated Sapphire. Then there's this version. This version is laid out exactly the same except the colors are drastically different. I actually tried this color scheme on my current site for a bit around Halloween, but it eventually got changed back to the blue and green colors much like it did years ago. It's a nice change once in a while, though. Real quick, about that bunny on the right. Once upon a time this greeting card showed up at my parents' house. I think it was an example card that some company had sent them. It didn't have any text on the inside and it wasn't from anyone. It was just suddenly there. I thought the image of the bunny was hilarious for some reason, so I scanned it and made the Gentle Rabbit Studios image out of it. It doesn't mean anything. Nor does the site being "Wood Man Approved." It was just me being stupid. Like before, this one had a name. I called this one Enkindled Cardinal. And there you go! I wish I had access to the really old Doom site I did, but I don't. I don't even know how far back those old snapshots go online, but even if my site was on there, I have no idea what the address to it used to be. It was on Xoom though for sure. I hope you enjoyed this look at my site through the years. See you soon.